A lot to tell since I updated last. 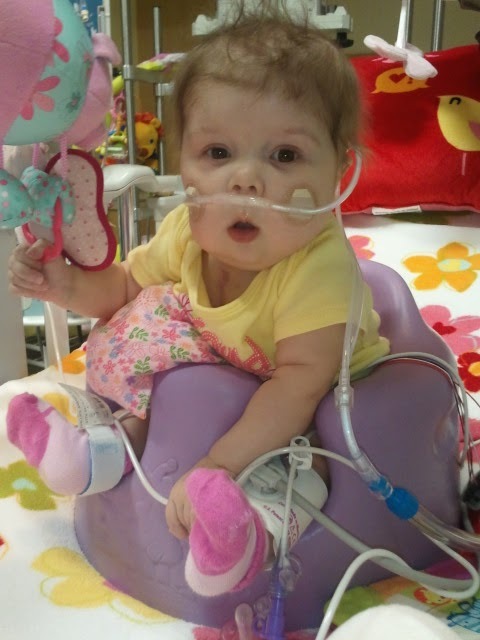 On Thursday, they decided to NOT do the placation surgery for her paralyzed diaphragm. Since she was off the vent, they felt that putting her through another surgery right now when there were a few other “things” we could try to get her through was unwise. We agreed to give it a week or two, and if we still couldn’t get better breathing, we would relook at the surgery. We kept her on CPAP until Thursday, then switched her to Vapotherm, then nasal canula Friday morning. We also started her on a 3 day steroid burst to help her lungs. She is doing MUCH better, and her lungs are CLEAR for the first time since transplant. WOOHOO!!! Given my slight nervous breakdown last week and Annabelle’s improvement… I decided to come home for a bit over the weekend. My kids needed my desperately, and I needed a break. So mid-day Friday, I went home. I spent the evening taking a walk with my kiddos, playing ball out in the front yard, and watching a movie. I slept in my own bed for the first time since… I think… Christmas Eve. MUCH needed. We then went out to lunch, then I went home and cleaned out our garage with a little help from kids and a lot of help from my mother-in-law! I know it sounds stupid, but I haven’t worked on accomplishing something at home in a REALLY long time, so it felt really good! I went back to the hospital Saturday night… and OH MY GOODNESS I needed to see my Annabelle! She was SO very cute and smiled when she saw me and I just loved on her a ton. She was doing SO SO SO good! Unfortunately, I woke up Sunday morning at the Ronald McDonald House with a horrible sore throat and am now starting to sneeze. I HATE COLDS. I haven’t been sick the ENTIRE time that Annabelle has been in the hospital, so I should be thankful (and AM thankful), but I’m now back home since I can’t go see her like this. My heart is aching! I’m trying to just enjoy being with my other kiddos though. Just hope I can kick this stupid cold QUICKLY so I can go snuggle with my Annabelle again!!! Also gotta need steralize my house again so it will be germ free when we bring her HOME! Which hopefully will be soon?!? She is on half of a liter of oxygen, and doing well. As soon as we get her OFF of oxygen, and she stays off, we can bring her HOME! I LOVE that word! Home Home Home!!! Ah, sweet baby–trying SO hard to get home. Take care of yourself, Krista. Prayers your way, always. She is sooo adorable!! Hope that you get well soon so that you can go see her. Praying also that she comes home SOON!! Thanks for the update. I'm praying for you all. So sorry about the cold. THANKS everyone for your prayers! I count myself very blessed that I haven't had a cold or been sick at ALL this whole time. God is good! I'd rather get it out of the way right now, so I can be WELL when she comes home! I'm glad Annabelle is progressing so well, but I'm sorry you're sick, Krista. I hope you evict that bug soon so you're able to see your princess. Continued prayers. Awe, what a cute picture!! Get better soon, Krista! Krista, I hope a couple of nights in your own bed rejuvenated you a little. I am praying that you are feeling better and that you can cuddle with your girl all you want. Annabelle, you go girl! Half a liter is practically room air. You can do it! We are all SO ready to see your pretty little face with nothing stuck to it. So happy to hear that Miss Annabelle is doing so much better. That is just awesome! I am praying for you both. I felt I was getting a cold and am trying something new from the health food store. It is called Umcka cold care. It is a herbal cold remedy, suppose to shorten the duration and severity of a cold. My cousin swears by it. Took it last night and feel better this morning, so we will see if it works. It may have just been allergies though. Take care and heal quick. So happy to have the update on Annabelle, and that the surgery was put off. 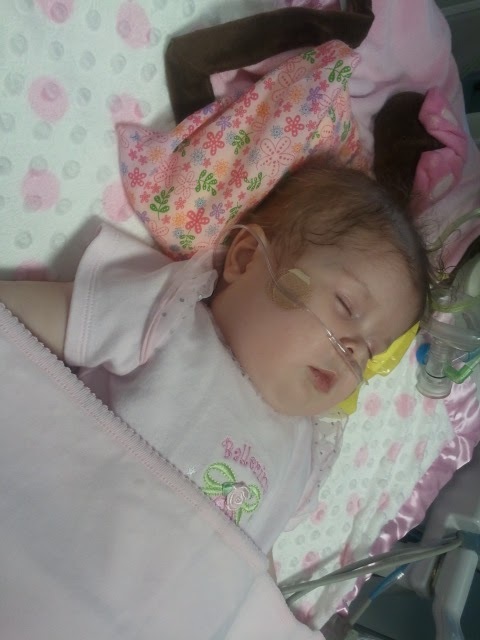 It broke my heart to think of Annabelle having to go through yet another surgery. I'm praying that she won't ever need it! I'm sure you agree with that. I found your website through a writer friend, and I'm glad I popped in. You, Annabelle and family are inspiration to me! By the way, I haven't been sick, even a cold, since 2006; when I started drinking XanGo mangosteen juice. Great stuff! Keep the faith, Mom! We're standing with you!